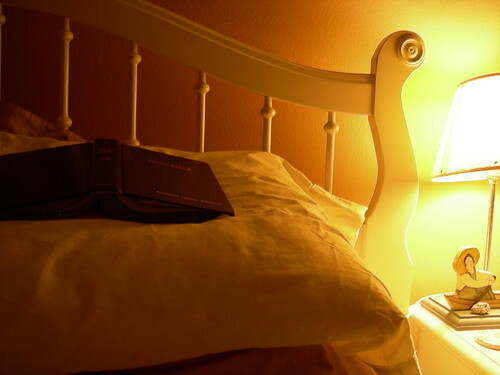 Last night, after my husband tucked me in and I kissed him goodnight, I reached for the Bible which I keep on my nightstand. I opened to Proverbs 18, then as I usually do, I rested the open Bible on my lap, closed my eyes, and began to pray. I picked up my Bible and tilted the pages toward the light. As my eyes focused on the words written upon the page, God's light of truth began to shine upon the pages of my heart. As I read verse 1, my heart was overcome with conviction. My heart began to squirm. Then, almost immediately, words of justification began to spew from my lips. Not me, Lord. OK. I'll admit I do isolate myself, but it's not because I'm seeking my own desires. You know me. You know how shy and timid I am. You know my fear of failure and how I worry I'll do the wrong thing or say the wrong thing or make matters worse if I get involved. Yes, I do try to avoid people, but it's not because I'm selfish. It's just who I am, a stick-to-myself-don't-get-involved kind of girl. I just prefer to go it alone. You know I've never been outgoing. I'm the queen of introverts! I'm not seeking my own desires. I'm not. I'm just being me. As I tried to convince God this verse had not been written with me in mind, my heart wasn't buying it, and neither was God. I could feel His Spirit confirming that yes indeed, He knew me; better than I even knew myself. And, like it or not, this verse had my name (and heart) written all over it. Forgive me, Lord. I never realized the true motive behind my actions (or lack of action) is selfishness, seeking my own desire. Thank you for loving me enough to show me the true intent of my heart. Take this selfishness, Lord. Rid me of anything that keeps me from being everything you created me to be. Give me the courage and the boldness to step out of my comfort zone, out of the safe lane, and into the lives of others. Don't let me allow inconvenience, or "uncomfortable" to keep me from touching another life. Chances are you can relate to this experience. Maybe not to this same passage and my revelation, but to a passage of your own and a time God opened the eyes of your heart to hear His voice speaking directly to you. God's Word is amazing. And, make no mistake about it. It is alive. Before we ever open God's Word, we should open our heart to His Spirit. God will be faithful to answer our plea. We come before you with grateful hearts. oh, this could be me. ummm, it IS me! and the Word penetrates through other people sharing it, as well.